Silver Spring, Md. (Friday, February 15, 2019) – Jackson Charitable Foundation, a nonprofit with the mission to advance financial knowledge on a national scale, and Discovery Education, the leading provider of digital curriculum resources, digital content, and professional development for K-12 classrooms, today announced Larry Miller Intermediate School in New Concord, Ohio as the $10,000 grand prize winner of the Cha-Ching Money Smart Kids! Contest. The contest invited elementary school teachers and families to take a pledge to teach kids how to earn, save, spend and donate. Larry Miller Intermediate School was also awarded a $1,000 prize to donate to their selected nonprofit, the Humane Society of Guernsey County, to underscore to students the importance of donating. 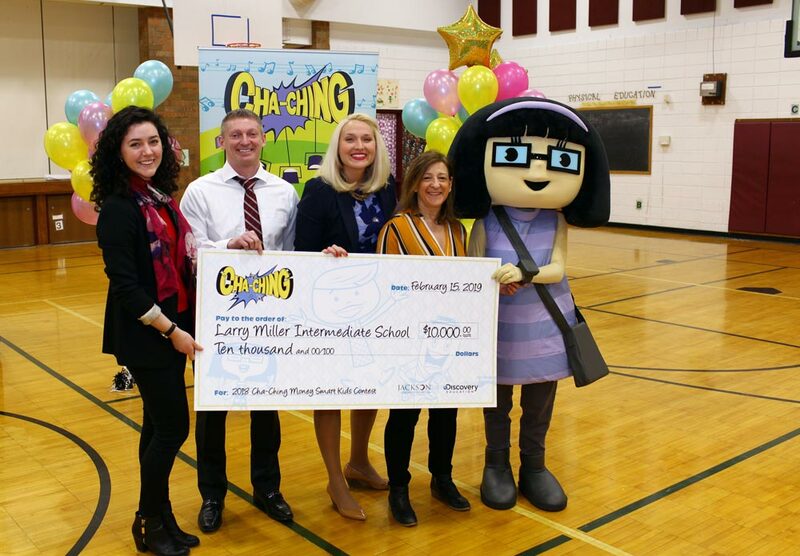 Students from Larry Miller Intermediate School will leverage their $10,000 grand prize to lead the school in learning Cha-Ching Money Smart Kids! financial principles through work with their student council organization. Students will engage in a school-wide service learning project to put fundraising, budgeting and donating principles into practice, giving them first-hand experience with money management and how they can use funds to help invest in their communities. Cha-Ching Money Smart Kids! aims to empower youth across the country with critical 21st century skills by beginning high-quality financial literacy education in elementary school, where financial education can be fundamentally embedded in the core learning experience. Available at no-cost, the program includes digital curriculum for educators, family activities and a back-to-school contest, designed to bring personal finance topics to life across all subject areas. This engaging and fun financial education program, designed to train the next generation of financially empowered adults, equips students in grades K-6 with the knowledge, tools and practice they need to make informed decisions to reach their goals and dreams. Since launching in April 2017, Cha-Ching Money Smart Kids! has reached millions of parents, students and educators. This partnership features the engaging Cha-Ching cartoon band comprised of six energetic characters, brought to life in music videos, that help children learn about fundamental money management concepts through the band members’ different approaches to money habits. The videos feature storylines that bring to life the four key concepts of money and were created by Dr. Alice Wilder, producer for Blue’s Clues and co-creator for Super WHY!. Cha-Ching Money Smart Kids! resources are available at no-cost at Cha-ChingUSA.org and are integrated into Discovery Education Streaming. For more information about Discovery Education’s digital curriculum resources and professional learning services, visit discoveryeducation.com. Stay connected with Discovery Education through social media on Facebook, Twitter, Instagram and Pinterest @DiscoveryEd. The Jackson Charitable Foundation, the charitable-giving arm of Jackson National Life Insurance Company, is a 501 (c)(3) private operating foundation. Its mission is to provide educational programming to increase the financial knowledge of Americans. Our vision is for all Americans to have the strong personal finance skills that allow people to live fuller, more self-directed lives. The Foundation works with Jackson associates and world-class partners to provide economic opportunities that build strong communities. Follow the Jackson Charitable Foundation at jacksoncharitablefoundation.org, on Facebook at @JacksonCharitableFoundation and on Twitter at @JacksonFdn.